Have you ever wondered exactly why a bride carries flowers down the aisle, or why a wedding isn’t complete without bridesmaids? You may have thought these were harmless customs designed to add tradition to a contemporary affair, but if you look a little closer you might be surprised by these strange practices, most of which date back thousands of years and have some pretty unusual origins. Having already talked about the confetti in a recent blog, we thought we’d take a closer look at a few of the most well-known wedding rituals, from the sweet to the slightly disturbing. 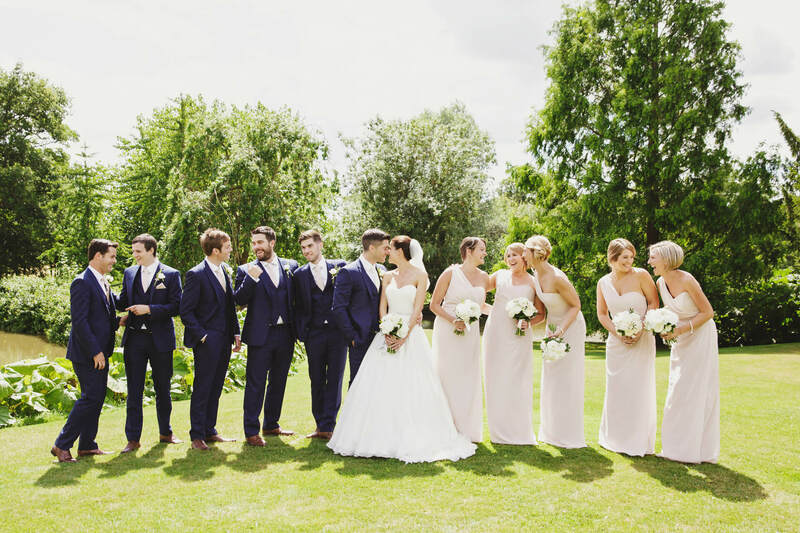 Whether you’re having a civil ceremony or are attracted to Birtsmorton Court as a wedding venue with a church on site, it’s still common practice for the bride to stand to the left of her future husband. In early Anglo-Saxon England a groom’s outfit wasn’t complete without a sword, traditionally worn on his right. The sword was more than just an accessory too, it was quite possible that an enemy or love rival would have been waiting in the wings, ready to swoop in and steal his bride away from him. A bride would always be found standing to the left of the groom, leaving him free to yield his sword and defend her honor. Whilst this practice is a little outdated, the bride continues to stand to the left of the groom, right next to his heart, a tradition we can all agree on. These days flowers are chosen based on colour and style. 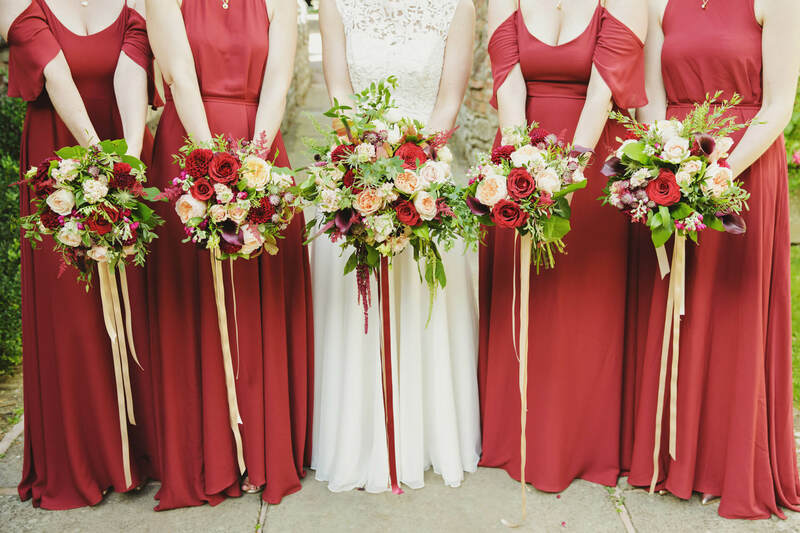 From graceful and white, to bold and bohemian we just love how flowers can be both an accessory and a statement, a core part to any West Midlands wedding. Bridal flowers weren’t always just for aesthetic purposes though. One of the primary reasons it is believed a bride carried flowers on her wedding day, was to mask unsavoury body odour. Considering this is a tradition that dates back to the Middle Ages, a time when bathing was not exactly a daily requirement, you can’t blame a bride for wanting to smell a little sweeter on her special day! But if keeping away a bad smell wasn’t a good enough reason to carry flowers, how about keeping away evil spirits. 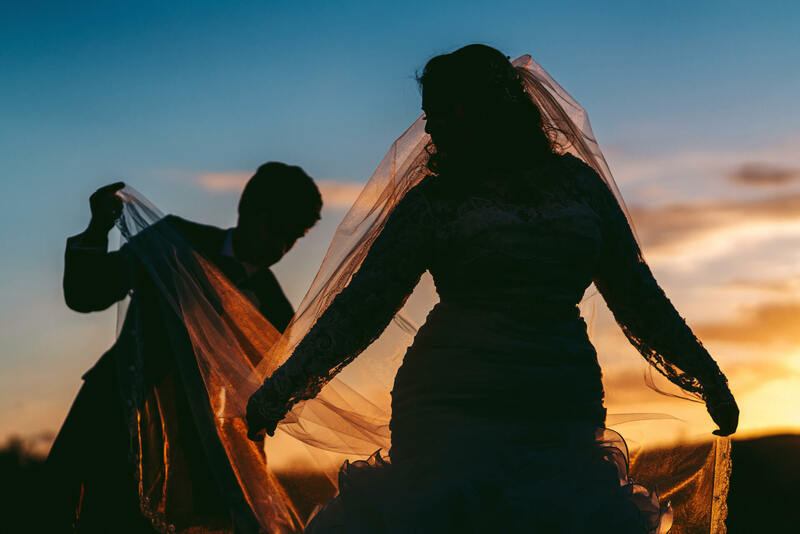 It was believed around the same time that fragrant herbs and spices helped to ward away any evil beings who may try to curse the bride on her big day. These herbs and spices would very often be included in the bride’s bouquet as a means of protection. In fact the royal family still keep with this tradition today. The Duchess of Cambridge carried a sprig of myrtle in her bouquet and this has been seen in all royal weddings since the mid-1800’s. We’ll all be keeping our eyes peeled on the 19th May to see this tradition continued. Despite covering yourself with herbs and spices, you can just never be too careful when it comes to evil spirits. Don’t worry though, the Romans had an answer for that. Take a handful of your closest friends, dress them in white and give them their own mini bouquet, which is apparently enough to confuse the spirit into attacking one of them by mistake. Luckily for the spirits (and for your friends), they wouldn’t have to risk picking the wrong person today as bridesmaids often wear a completely different colour. Good to remember, when it comes to choosing your bridesmaids, pick someone who can pack a punch! It was Queen Victoria who first chose to wear a veil down her back instead of covering her face, and whilst veils are no longer mandatory, they are just as popular as ever. Steeped in tradition, the veil is supposedly the oldest part of the bridal ensemble, and guess what the veil was originally designed to protect the bride from, that’s right, those pesky evil spirits. That isn’t the only use of the veil. Looking back to when arranged marriages were still commonplace, the veil played a dark role in a young couple’s day. In an arranged marriage, the bride and groom would have often not have seen each other prior to the wedding. Let’s remember that arranged marriages were often designed for the financial benefit of the families involved, rather than the couple themselves. To prevent the groom taking one look at his prospective bride and reaching for his running trainers, a veil was used to hide her appearance. Her face would only be revealed after the ceremony was complete, ouch! The buttonhole takes us back all the way to medieval times. Way before football ever existed, the big sport at manors like Birtsmorton was jousting. It would draw huge crowds and nobility from far and wide, competing to claim their glory. Dressed head to toe in armor, a Knight’s attire would not be complete without a small token from his beloved, usually a handkerchief or small flower representing the lady’s colours. This token of love would be bestowed upon her Knight in shining armor before a match and he would fight his duel in her honor. If you take away the jousting and potential death, this isn’t a tradition that has changed too much. Still a groom and his groomsmen will wear a small token in the bride’s colors over his heart to show the world his everlasting love and commitment. Perhaps the hardest tradition to swallow is that of the best man. 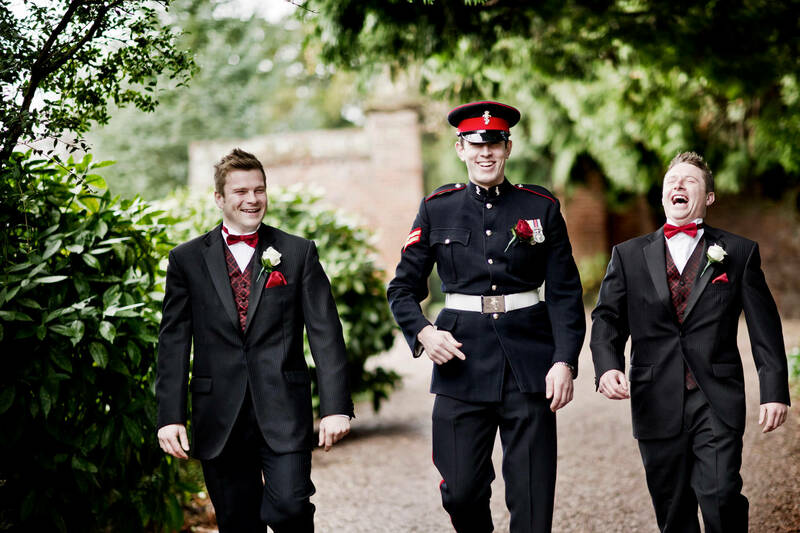 These days the best man is usually a close friend of the groom and his duties are: One – plan a stag of epic proportions. Two – make sure the groom is awake, sober and at the ceremony on time. Three – bring the rings. Four – prepare and perform a hilarious, show-stopping speech. Now, that might sound like a lot of responsibility to give to one man, but if you found yourself looking to get married in the Middle Ages, you and the best man would have had a very different experience altogether. To start with, he wouldn’t particularly need to be a friend, so long as he is a dab hand with a sword. What’s the sword for? Well, you’d find a sword comes in very handy when you kidnap someone’s daughter and take her as your bride. ‘Marriage by capture’ was common practice in the Middle Ages, with marriage being more about position and wealth than love. But it’s okay, you don’t have to do it alone, your brave sword yielding companion is with you, ready to fight her family, whilst you and your new bride make a quick exit. He really was the ‘best man’ for the job. So always remember, no matter how tragic the Best man’s speech may be, at least you are marrying the person you love. So there you go, a potted history on wedding traditions. Thankfully, we’ve come a long way, but maybe in 100 year’s time someone will be writing a blog about a ‘Pimp my Prosecco’ station…. Please don’t delay to get in touch to book a private viewing. Dogs at weddings? We woof them!